Harrington will lead Team Europe into action next year. Harrington returns to action in Malaysia this week. PÁDRAIG HARRINGTON PROMISED to give his players a “pat on the shoulder” and make them feel comfortable when he steps up to captain Europe’s Ryder Cup team next year. The 47-year-old Irishman was given the honour in January after making six appearances as a player in the biennial showdown against Team America. Harrington, a three-time Major winner, was also part of the winning team four times (2002, 2004, 2006 and 2010) and served as vice-captain in the last three Ryder Cups. Speaking ahead of this week’s Maybank Championship in the Malaysian capital, Kuala Lumpur, the Dubliner said being captain will be a different ball game altogether. “Even though I have played six times, you learn so little when you play. You are just doing your own thing,” he said on Wednesday. As vice-captain, you see much more. Every player will be different in what they need and what they want. “Every player needs information, but also a pat on the shoulder that you believe in them. 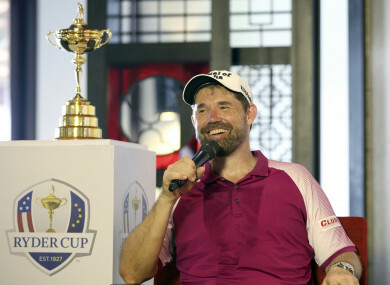 Harrington’s predecessor Thomas Bjorn, who led Europe to victory last September in Paris, said the panel discussion to nominate Harrington as captain did not take long. “With his Ryder Cup record, with his Major record, the player he has been over the years and where he sits in European golf, there was never a question,” said the Dane. The Maybank Championship will be Harrington’s first tournament of the year after he broke a bone in his wrist falling down stairs at his home in December. Email “'Every player needs information, but also a pat on the shoulder': Harrington on his captaincy style”. Feedback on “'Every player needs information, but also a pat on the shoulder': Harrington on his captaincy style”.